Is anti-semitic feeling as entrenched in Iran as the government makes it seem? 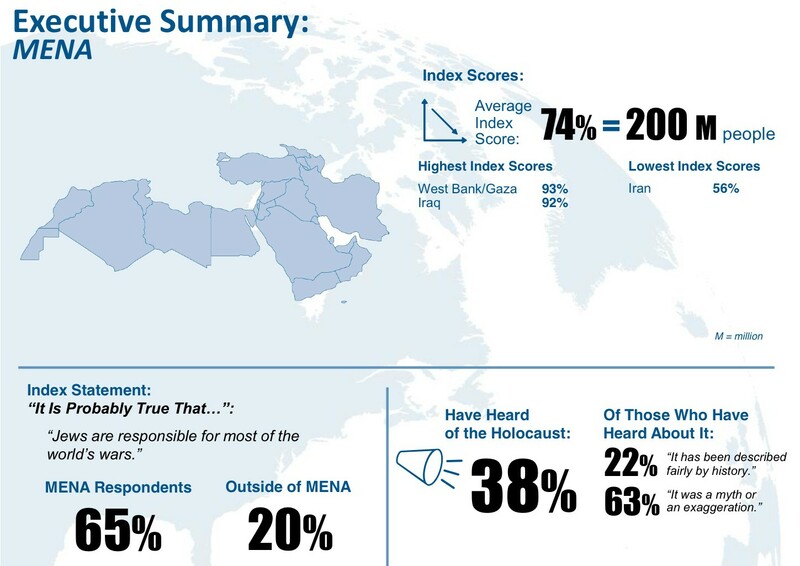 Summary of results in the Middle East and North Africa from Anti-Defamation League's Global Index of Anti-Semitism. Click image to enlarge. In the past few years political leaders in Iran have expressed some radically anti-Israeli opinions. In one controversial statement, former president Ahmadinejad even denied the Holocaust. Of course, political leaders always make sure to emphasize that they don’t have any problems with Jews. But, in this political climate, it’s not a surprise that Israel also sees Iran as its greatest enemy. Of course, Israel always emphasizes that they don’t have any problems with the people of Iran—just the Iranian government. Still, any anti-semitic action or opinion from an Iranian, no matter how trivial, can provoke debate and elevate tensions. As it stands, the atmosphere of skepticism between the two countries is dramatically pronounced. 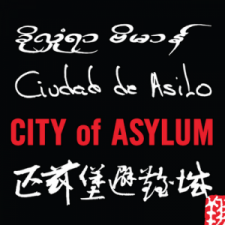 However, a recent Anti-Defamation League survey has released data that could work against the clichés that exist in both countries. The Anti-Defamation League’s data shows that the population of Iran has the lowest amount of anti-semitic feeling among Middle Eastern countries. For a country whose leaders have spoken out against Israel for years, this is a very meaningful finding indeed. According to the survey, the country with the most anti-semitic feeling is Palestine at a rate of 93 percent of the population; next comes Iraq with 92 percent, and Yemen with 88 percent. In Saudi Arabia and Turkey, respectively, 74 percent and 69 percent of the population hold anti-semitic feelings. Greece comes in at 69 percent, with the highest number outside the Middle East. With a rate of 56 percent, Iran ranks even below Greece! For comparison, South Korea is at 53 percent, and in France the figure is as low as 37 percent. It’s interesting that the percentage of anti-semitism is higher in countries like Malaysia (61%), Greece, and Armenia (58%) than it is in Iran. Another part of the survey asked its participants: “Do you think that the Jews talk too much about the Holocaust?” In Iran, only 18 percent agreed with this statement, while 22 percent of the United States’ population agreed. Looking at the results of this survey, does this mean that the Holocaust is important to a greater percentage of people in Iran than in the United States? Keep in mind that many people consider Iran an enemy of Israel, while America is seen as its ally. In any event, the numbers given by this survey subvert, or at least cause us to reevaluate, accepted political stereotypes. When looking at the results from Iran there is another element to the statistics that we should consider. This survey was conducted in one hundred countries by phone. If we consider the atmosphere that’s been created by Iranian security rulings, which have made some citizens wary of talking on the phone to people from outside the country—especially about a topic as sensitive as the Jewish population—one could guess that some Iranians answered conservatively, in accordance with the Iranian government. It’s possible that, under free circumstances and without pressure, many of the 56 percent of Iranians who gave anti-semitic answers would change their opinion about the Jews. If we are to go by this survey, it seems that the anti-Israeli and anti-Holocaust propaganda that Iran’s religious government has spread over the years has had no effect on half of the Iranian people. On the other hand, it’s surprising to me that countries like Turkey and Malaysia, which are purported to have secular governments, foster greater anti-Semitic feelings than Iran.